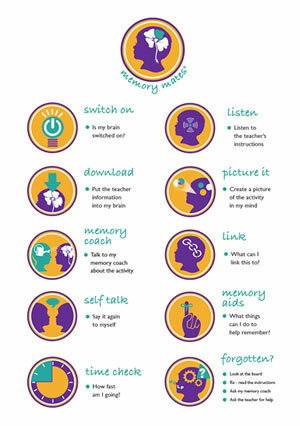 This summary of the Memory Mates strategies (pictured at left) is given to each student (laminated) as a personal overall reminder. The wording of the icons is student-focused to give the students ownership of the strategies. Students can also have the full set of Memory Mates strategies on their desk as a personal reminder. In addition, a copy can be put on the classroom wall, along with a picture of each icon. It can also be helpful to give each student a copy to take home. There is also another summary handout included, with cut-out lines depicted, which can be used if you want to work on specific strategies with a student or several students in a group. This handout can be cut up, and the single strategies kept by the individual student(s). The strategies’ icon(s) can be used as visual supports to remind and reinforce using key strategies. Downloadable PDF copes of the Summary Handout and a version with cut-out lines are available here on the Resources page.